Mr. Pankaj Mehndiratta and Mr. Mathew K.K. conducted those sessions. There was another important session on disability rights that was taught by Dr. Madhumita Puri who is the secretary of Society for Child Development, one of the producer groups that supplies MESH. 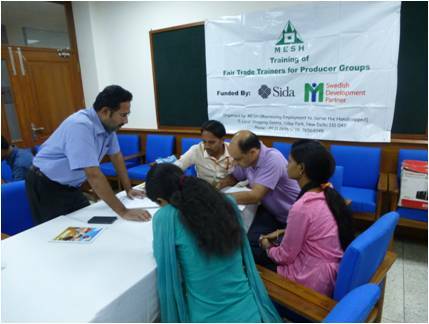 There were eleven participants from producer groups and two MESH staff taking part and Gabriel Rajsingh who is MESH social worker commented in his report after the workshop, that participation was good with everyone coming away with plans to conduct training sessions among their fellow artisans in each group. There was also a willingness to begin to collect together the necessary documents to demonstrate their compliance with the ten Principles of Fair Trade. In the feedback forms we were encouraged to find that five of the participants felt that the most important learning was the need to keep records of meetings and artisans and transactions. If they have grasped that then MESH's job to help them to do that will be that much easier. Gabriel Rajsingh is to bring together fair trade news and any news from the participants and circulate a newsletter in Hindi for all the participants once a month.